A recent study by Australia’s Flinders University has shown that if you play video games for 50-150 minutes before going to sleep, your sleep pattern can be disrupted. The study, which was supervised by Dr. Michael Gradisar, tested 17 teenagers playing violent video games for 50-150 minutes before they went to sleep, and the ones who played for two and a half hours showed a 27 minute loss in their sleep and a 39 minute delay in sleep onset. However, teens who played for 50 minutes had more or less zero effects on their sleep cycles. It took them about 22 minutes to fall sleep, which is how much it should take at their age. Those who played for 150 minutes, however, had their sleep onset delayed to 39 minutes, almost double. It’s also important to note that this study doesn’t take the content of the game into account- be it as violent as God of War or as charming as Kirby, only the effects are being studied. That’s it. 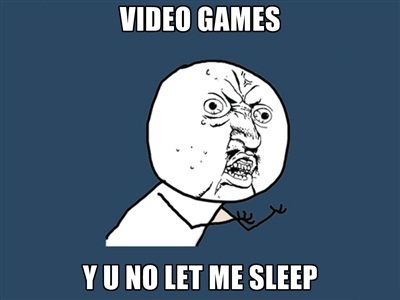 No more FIFA before I go to bed.